Sal Lagattuta joined the music staff of St. Peter's as an interim organist in the Fall of 2009. In 2010 Sal accepted the permanent position of organist. 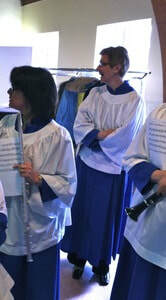 In July of 2011 he assumed the role of choir director and Director of Music, which he currently holds. 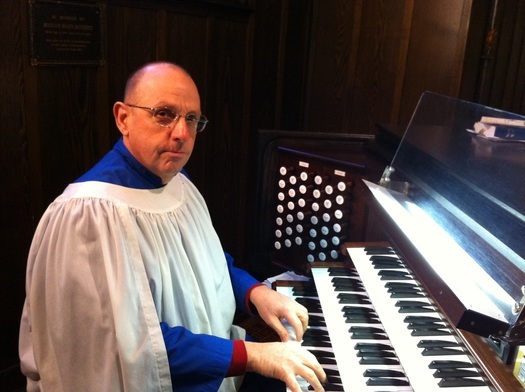 Sal brings to St. Peter's over 38 years of experience as a church choral conductor and organist. Sal holds a Bachelor of Arts in Music degree and a Masters Degree in Music Theory and Composition from Montclair State University. While at Montclair he was the assistant choir conductor to David Randolph and the Montclair State Jazz band director. Sal's organ studies included instruction from Russell Hayton, Montclair State University; Lillian Carpenter, retired Julliard School of Music; and Dr. Claire Coci, Union Theological Seminary. Sal was a music educator in the Bayonne and Kinnelon school districts before ending his 34 year career in retirement as the district Arts Supervisor for the Montville School District. Prior to coming to St. Peter's, Sal served as organist and choir director at Trinity Episcopal Church in Bayonne, Rockaway Presbyterian Church, Sparta Methodist Church, Dover Presbyterian Church, and the Sussex Presbyterian Church. He has performed organ recitals in both North Jersey and New York City in the early part of his career. He is also a member the North Jersey Chapter of the American Guild of Organists. "When in our music God is glorified..."
St. Peter's Church has had a wonderful tradition of incorporating music within all of its worship services. This is done through the coordination and dedication of its own church members. Our Chancel Choir rehearses on Sunday from 9-10 AM. Our membership in the choir has remained strong over the last year and we would like to see it grow. I would like to extend a personal invitation to the people of St. Peter's, high school age and older, to consider joining the choir. Many people think that you have to be a trained musician to be a part of the choir; but that is not really the case. Although we have several musicians in the choir, we also have people who enjoy singing and have come to understand how to follow the choir music that we learn and perform. It does not take long to obtain a functional understanding of music. The only requirement is to have a desire to sing God's praises and have an enjoyable time with others doing that. It's that simple. Some people believe you need to have a great voice. The choir is made up of many different people with many different vocal abilities. The beautiful picture of a puzzle becomes realized after all the pieces are put together; no matter how small or big, straight lined or crooked those pieces may be. It is the pooling together of our singing abilities that, when put together, create the one beautiful sound that is our Chancel Choir. 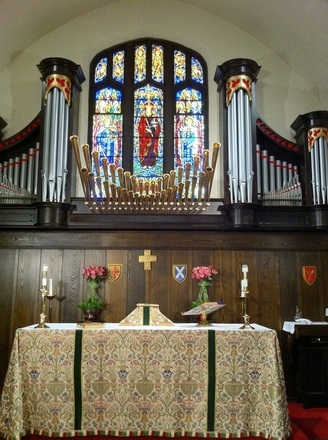 St. Peter’s organ has recently been restored by the Peragallo Organ Company, and has been upgraded with a three-manual and pedal English drawknob console. New digital switching now connects the key desk to the pipes throughout the organ. The pipework includes ten ranks of the original Estey organ, dating from the early part of the 1900s. The instrument now features 28 ranks of pipes, including a Tuba, Trumpet, Flute and a Zimbelstern. The festival trumpet pipes are positioned horizontally (en chamade) in the Chancel area to project sound into the Nave of the church. A beautiful new mahogany console has been installed. Most of the pre-existing pipes, some more than 100 years old, have been incorporated in the restoration and, together with the new pipework, add a degree of brilliance never before heard at St. Peter’s. The organ is virtually a new instrument. Call the church (973-334-4429) for more information about our music programs. Music soars at St. Peter's, with our beautifully restored organ and a growing music program. Our Senior Choir leads the 10:15 a.m. Sunday service and participates in many special services throughout the year. Rehearsals are at 9 a.m. on Sunday mornings. More voices are always welcome! The Choir is not active at services during the summer months. Instrumentalists, both youth and adult, lend their talents to the music program on many occasions throughout the school year.